THE INSTRUCTIONS BELOW ARE OBSOLETE! USE THE PPA IN THE LINK FOR EASY INSTALLATION. BREAKING NEWS! Netflix on Ubuntu linux works! And it works great too! A winner has been found! 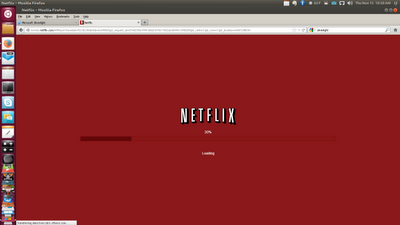 Back in March of this year I Heart Ubuntu put out a call to get Netflix on Ubuntu working. Somehow. Legally. Without the need to install a virtual OS and have to boot into it. Something as native as possible. The solution? Get Firefox and Microsoft Silverlight working in WINE. Its not as easy as it sounds. A custom built version of WINE is necessary to add in several patches to get everything working properly. It currently works on 32 bit versions of Ubuntu (tested so far on 12.10). 64 bit compiling is tricky so its best to wait for the PPA coming very soon. Want to try getting Netflix on Ubuntu working yourself? Ready to go?? There is a PPA coming out soon to make installation much easier. If you are not comfortable with compiling software in linux, I recommend waiting for the PPA. * This build is not compatible with “vanilla” Wine, so installing this custom package will uninstall any existing Wine installation you have. Back up your current WINE folder to be safe. ** Please read through the instructions first before attempting. Reread if you experience any problems. That should do it! Did it work for you?? I personally had problems with step #4, so I manually downloaded both Firefox and Silverlight and ran the EXE files by right clicking them and installing. All worked great after that. Please consider donating directly to him via ChipIn. He is also developing a simple to install Netflix App for Ubuntu using a PPA to make everything much easier (as well as installation for 64 bit Ubuntu). We will update this article as soon as the PPA is available. Until then you will have to compile WINE yourself using the above instructions to get Netflix working.